I woke up completely exhausted this morning, having gone to bed just a tad too late. I tried to imagine what my day would entail, and how, at some point, I would get to the beach for a long overdue walk along the shoreline. At some point, I stopped focusing on what needed to be done to get there and became absorbed in my positive attitude. Being that I have felt really frustrated lately, as though everything is more of a weight than a set of wings, I find the feeling refreshing. I miss this light and airy personality, am looking forward to things again, and feel like I can almost cope with just about anything…though angry people still throw me a bit. Where did this come from? I’m not tired anymore and haven’t been for a while. I hardly notice as the day rolls along. I’m still celebrating some new steps with my staffing company and seeing growth w/my boss at the computer store as well. I’m feeling like even if I have to abandon living in Wilmington, and believe me, I think about it daily…moving back to Maine will be a step that I take with energy. My kids will be home, I will back with my family, I will spend time with friends, and I may already have an employment opportunity in place. I will smile and laugh a lot more, go to and host cookouts more, spend hours sitting around bonfires sipping an adult beverage, and go to work throughout the week. My kids will be happy…their smiles will return…their laughter will be deep and throaty once more…my husband will come home not emotionally exhausted…and I will get to bask in all this as I watch my family come back together as a unit vs. various individuals sharing a home. OK- back to adventures. I’m reaching out to anyone who reads this, or anyone who has friends in and around Wilmington. I’m looking for drives of no more than 3 hours, give or take a few minutes as I know Charlotte and thus my friend Mel are just over the three hour mark. I’d like to visit any and all fun spots in the area…get my boys out of their easy chair and video game lifestyles, and start visiting touristy and “off the beaten” path places as well. Myrtle Beach is for sure on the list. And then the town in SC which is home to a museum and display about the Tuskegee Airmen…I can’t wait to go there. Also thinking the Outer Banks at some point…but for now, do this on the cheap and not go bonkers! In the throws of these torrents of rain, which as I understand it are mild in comparison, I thought it would be time to reach out with a little sillyness. A Favorite Photo, Carolina Beach!! Wilmington, NC – So you are relocating!!! First of all, let me say that the cost of living in Wilmington is very affordable. If you are coming from the northeast, or the west coast, imagine paying about a third. For example, we are living in a three bedroom condo, in a gorgeous development which has a pool- $875/month!! I don’t mind saying that out loud!! In New England, as we relocated from Maine, this number is unbelievably affordable. I remember when we visited this house, thinking OMG this will be way out of our pay range, or that the neighborhood would be rough based on the rent price. Or maybe that our kids would be attending a rough high school! To our joy… the neighborhood is lovely, we are within 15 minutes of everything Wilmington has to offer, we are 5 miles from Carolina Beach, 13 miles from Wrightsville Beach, about 90 minutes from Myrtle Beach SC, and Ashley High School is absolutely gorgeous with a large fantastic community of teachers and students. In New England, this same setting would put us in the $1200 per month price range! That’s right…almost a $400 dollar difference. Now, upon arriving, please be ready to leave deposits with every utility service company…and when I say deposits, I mean roughly $250 for electric and water, $100 for cable/phone/internet, and for those who don’t have trash pickup included in their development or HOA, there are a few companies to choose from or deliver yourself to the landfill. Now, to avoid lots of deposits, you can hand deliver a copy of your credit report, and if your score is high enough, avoid paying the deposits…I don’t know many people who carry that in hand though! Likewise, you’ll also be changing over your license and insurance and license plates. For your driver’s license, be prepared to take a written test, or rather a computer test! I was completely unprepared but luckily, passed the first time! Now, the license plates cost will be related to the vehicle you drive, what it’s worth…similar to anywhere you live determining how much registering your vehicle will cost. Also, in regard to insurance…unlike the state you have relocated from, your insurance may or may not be valid in North Carolina. I learned this when I went to register my vehicle…I had AAA insurance. In Maine, totally legal…in North Carolina, not valid. I had to leave DMV after waiting about 1 hour in line…go to AAA and find a new provider for our existing policy, one that was NC friendly. $150 later and new insurance card in hand, we were back in line…this time able to register the durango. My friends here say that in order to fully become a valid NC driver, with license and insurance and plates, you should allot 3-4 visits to DMV. Let me advise you to call NC DMV ahead of time…lots of paperwork required and better to know whether or not your insurance is valid. Be prepared with a “safety net” just to get setup! If you are lucky, you have a job in place upon arriving to our city but if not, be ready for a thorough search. Prepare for payscales to be less, about a third less. For example, I recently took a part time staffing job. In Maine, I may just over $37K/yr before commissions or bonuses. The business owner at the staffing firm asked me what I expected for pay…he already had the exact same number in mind as I did but he wanted me to say it…I thought outloud, based on NC paying about 1/3 less than Maine, I could expect about $25K/yr before commission & bonuses, IE $12/hr. This is less than in Maine, but more than I make at my other part time job…so, because it is in my field, after 6 months of looking, I immediately jumped onboard even on a part time basis. Be prepared, do your research, look at the Wilmington websites…find the top lists of employers in this town. Be flexible, be open to new opportunities. It may take some time but your search will bring you results. Remember that right now, the market is flooded with well educated professionals…niche markets have an advantage here as do business owners who are opening their own business. Lots of sales and industrial work in Wilmington, customer service/telesales/telemarketing are big, some construction and of course, skilled labor…medical is huge! Now, in looking online before I came here, I saw either positive or negative reviews of Wilmington…no “in the middle” reports. I have learned that folks either really like or really dislike it here. I can say that I really like Wilmington though I miss my sister and nieces and my dad. While I get frustrated from time to time, I’m still enjoying my time here. I’m trying to sell my boys on staying in NC…they are both in high school so this move was hard on them. I’m working to find a job for each of them, hoping that making some cash will encourage them to hang in here, taking some time to make new friends, and make the distance from Maine not seem so far. They are strong though and smart…and worse case scenario, will finish school then return home and stay with family when the time comes. That is my take on Wilmington…I have more positive than negative to say. I’m open meeting more people, networking regularly, and hoping to get more involved locally in my end of town and in Carolina Beach. I’m encouraged by the changes my life has taken, am looking forward to learning to “shag” with the locals, but still have moments of being homesick and feeling doubtful. I have made a few friends here, but again, tight budget prohibits the night life I’m accustomed to…I’ll get there though. I have no doubt…soon my network will have expanded, my margarita count will increase, and with any luck, my boys will be rockin and rollin into their next steps here in Wilmington, or at least one of them! If you are relocating, this is a wonderful city…be smart. Do your homework, check out the Chamber of Commerce, Whats on Wilmington, and other city sites. If you need certifications or licenses for your job, do your paperwork ahead of time and be prepared to take related exams or whatnot immediately upon arrival to our town. Questions? Just ask! I’ve been asked to write about great walking spots in Wilmington, and in our community there are so many places that I could honestly add a new place every day. So, in true writing form, I’m feeling like that is how this will be written, with each walk receiving the details and attention required. With the long term goal being to visit each place, provide details, and give a brief description of my walking experience, we could be in for a very wordy blog! Today I spent my afternoon at Carolina Beach. I’ve walked from the boardwalk area all the way down to the pier, close to the Kure end of the beach. I’ve walked the boardwalk both ways as well as walking in the sand along the water’s edge. What I find without a doubt is that near the water is my favorite place to walk. Granted, as of late the beaches are empty and it’s like having the beach to myself along with a few dedicated local walkers, and of course, runners/joggers and people walking their dog. It’s a very friendly place and absolutely beautiful. There is parking all along Carolina Beach Blvd. as well as paid parking, and no doubt there will be paid parking lots. My theory is that since my kids rarely go to the beach with me, I can park just about anywhere and enjoy my time strolling leisurely. The breeze provides waves in the sky for the birds to coast upon, the sand is soft and getting warmer every day, the water chases the edge of the sand depositing pretty shells and stones, and the atmosphere is perfect regardless of who you are. Perfection…sand, surf, sun and sky! However, if you are traveling with children or just like the traditional boardwalk, that is where I would park the car. There are shops and restaurants and mini golf as well as pizza and ice cream. Conveniently located just before entering part of that beach is a shower, so if you get messy from the ice cream, you can rinse off prior to heading into the sand. For folks who love walking the beach and have four wheel drive, Freeman park is a great spot to consider walking. Drop the vehicle into four wheel drive, head out onto the sand, find a spot and take a stroll. From what I understand, the fishing out that way is fantastic as well. So ladies, hand your man and/or boys the poll then grab your chair and book, take a stroll, and enjoy a cool drink while the fellas fish for a bit! For the avid walker, Wilmington has many locations which can be utilized to keep up the daily regimen. Whether you walk for an amount of time, or run/walk a certain distance every day, there are several options to choose from. The great thing about walking or running, you can do this anywhere and blaze your own path! From the local beaches to downtown and historic district to Airlie Gardens, there is a place for everyone to get their walk on. Other options include walking over the bridges, over the hills, but all the while enjoying beautiful views of the Cape Fear River. Check out some of the following locations or be creative and create then post your own routes! This 5 mile loop around Greenfield Lake, just south of the downtown area, is among the most beautiful places in Wilmington to jog or walk. The paved path is scenic, has mile markets, and follows the lake shore as well as crossing two wooden foot bridges. This is a peaceful, green, and lakeside stroll that should not be missed. 58 Acre Halyburton Park is located in the southwest side of Wilmington, near Independence Blvd. This park is handicapped-accessible, a 1.3-mile walking/bike trail covering some beautiful natural areas, and a great path for those who aren’t up to multiple mile walks. However, for those into multiple miles for walking and jogging, a few trips around the path will easily add up to fit into the regimen. Thirty-three acre Empie Park has athletic fields, picnic shelters, a playground, tennis courts, basketball courts, restrooms, open space and a senior activity area. This is a large facility with many walking areas, for people and also your four footed friends. This is a fairly popular area, so expect a beautiful walk in the company of many. Once around the loop or multiple times around, again your walk will be just what you need to get up and moving. Hugh McRae Park is one of the oldest and best known area parks, locally and in the county. Overall, the park is 98-acres. There is a walking path traversing the park, along the pond and around the park. Its a nice little escape from the hustle and bustle in the city. Wilmington’s Riverwalk fronts many business dotting in downtown, along the Cape Fear River. Riverwalk’s wide boardwalk begins at Nun Street in Chandler’s Wharf and runs to the convention center. More than a mile of walking, a safely lighted path. The Riverwalk , built over several years, is a Wilmington shining must see stop. Along the Riverwalk at the foot of Market Street, you’ll find a visitor’s information center and berthing for the Heniretta III. While touring the walk, also take in the farmer’s market Saturday mornings, historic and local sailing ships visiting the local docks, and often times festivals and shows happening in front of the government center. Not only is the walk beautiful but also houses local, cultural and historic happenings. Its a wonderful way and place to get a taste of downtown Wilmington at its best! Airlie Gardens is absolutely stunning, a staggering 67 acres of flowers and fauna. It has a rich deep history here in Wilmington and well worth a visit. The winding paths through various gardens, each with its own story, provides an excellent though somewhat casual walk…not to mention a great picture taking opportunity. You are able to set your own pace in the self guided walking tour provided on the pamphlet map. There is nothing healthier than tiptoe-ing through the tulips and gardens, being out among nature, taking memorable photos, and at the same time doing a healthy walk. Of course, if you’re an off the beaten path kind of person…explore some of the school fields with their beautiful concrete walking paths; visit a random neighborhood where you are staying and take in the beautiful magnolias and camellias; walk around the shops near where you are staying; brave the mall, its no small feat walking the perimeter inside and/or outside. For anyone, there is the right location…some are traditional and already blazed and for others, its a freshly cut path. Either way, the avid walker visiting Wilmington will not be disappointed. While visiting Wilmington, NC…consider some of the less visited but still popular areas to visit. From beaches to forts and museums, Wilmington has something for everyone! Carolina Beach: Carolina Beach is located 10 miles east of downtown Wilmington. Carolina Beach offers a white sand Atlantic coastline, many excellent restaurants and bars, Britts donuts (a favorite of the locals), ocean front hotels, and the boardwalk for the beach shoppers and arcade fans. Likewise, there are several options for bike and kayak rentals, excellent spanses for walking, and for the beachcombers, more shells than you can possible scoop up in one visit. Carolina Beach has much to offer tourists visiting the Wilmington/ Cape Fear area. From downtown, following US 421 East to Carolina Beach. Kure Beach: Just east of Carolina Beach, Kure Beach is a very small area with a lovely boardwalk and fantastic beaches. 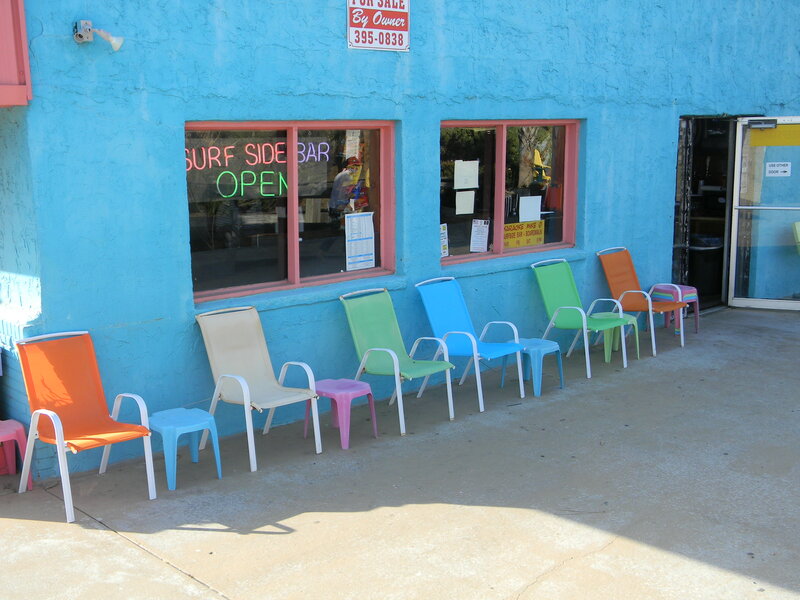 With a small but friendly atmosphere, Kure Beach is a quieter beach visit, close to a small local market and ice cream shop. Fort Fisher: Fort Fisher hosts a civil war museam and is a must see spot. The museum offers maps and exhibits to its visitors, explaining the battle of Fort Fisher and civil war relics. Along with the relics, there is a beautiful path and another small beach as well as the boat launch area. While visiting Fort Fisher, keep an eye out for the Southport ferry coming through the bay to dock near the boat launch. The scenery is stunning with rolling greens against the blue of the sky and water. For the brave, there is a jetty that extends out into the water. Fort Fisher also has a small picnic area and is a nice quiet getaway with history and charm. Fort Anderson: Fort Anderson is a confederate earthen fort build on the site of Brunswick town along the Cape Fear River. Fort Anderson protected Wilmington form the Union attack from the southwest side of town. The fall of this fort, along with Fort Fisher, led to Union occupation of Wilmington in 1865. Fort Anderson and the site of Brunswick Town is interesting to vist for those interested in colonial and civil ware histroy. From downtown Wilmington, take US 74 West to the Belville exit; take River Road 9SP133) south to Orton Rd SE. Fort Anderson is about 18 miles southwest of Downtown Wilmington. North Carolina Aquarium: The Cape Fear North Carolina Aquarium is one of three aquariums in North Carolina. This aquarium has low country ecosystems, fresh and sale water fish tanks, and a reptile zoo. When traveling with children, the aquarium is a fun, educational, and interesting place to visit. From downtown, take US 421 East for approximately 15 miles from downtown Wilming, past Carolina Beach and Fort Fisher state park. Wrightsville Beach: Wrightsville Beach is a close drive from Wilmington. The town offers various activities including a pier, beach shopping, a long stretch of white beach, excellent beachcombing, restaurants, watersports, tours and cruises, kayak rentals, and beautiful scenery. Likewise, there is bird sanctuary on one end of Wrightsville Beach and on the other end of the beach, a park that is quiet and scenic with dunes and walking paths through the dunes. Wrightsville Beach can be reached easily and efficiently but be prepared to pay for parking. Otherwise, it is absolutely stunning…bring your camera! Topsail Beach: Topsail Beach is easily a half hour or so drive from Wilmington. However, Topsail Beach is a nice area which houses a Sea Turtle rehabilitation center and hospital. The facility just won an Animal Planet award and does much work to care for turtles and eggs laid along the Carolina shoreline. This is a nice community, beachy and friendly, and a nice drive and place to visit. It has restaurants and shops as well as a lovely beach. Airlie Gardens: Airlie Gardens is a large botanical garden on the Mayfaire side of Wilmington and not far from Wrightsville Beach. For the avid flower lover, Airlie Gardens has an abundance of local flowers, walking paths, and a fantastic history covering various eras in American History. 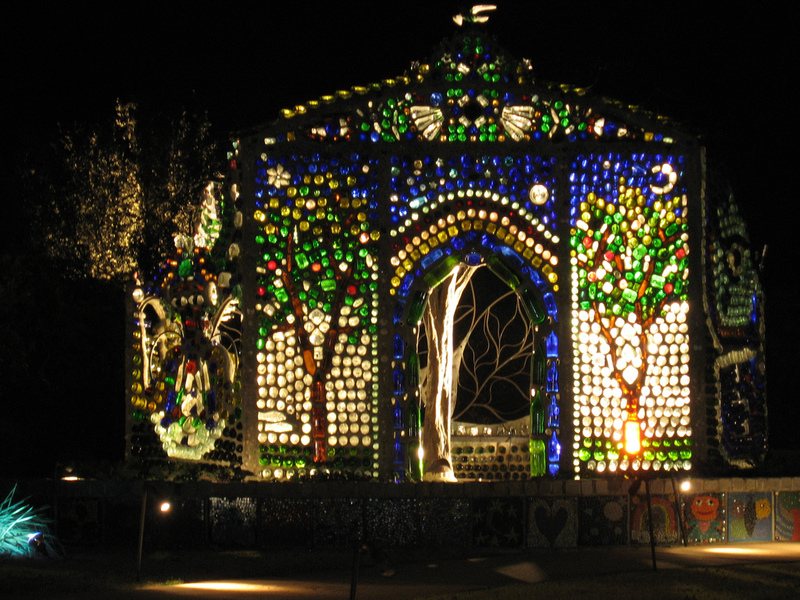 The picture above is the Glass Bottle House…made of glass bottles. The sunlight refracted is stunning…very original and breathtaking art!